Rolling Thin Film Oven for Bitumen Testing - The Rolling Thin Film Oven Test is used to obtain homogeneously aged material by the application of heat and air in order to simulate these affects in conventional mixing. The oven is of double wall construction with side vents and of the heated convection type of air Circulation. An electronic controller maintains the temperature at 163+ 0.5� C. A vertical, carriage is supplied to support 8 glass sample containers, which are rotated at 15+ 0.2rpm. An outlet orifice 1mm in diameter is connected to a 7.6m length of copper tubing and flow meter which controls the airflow at 4000 ml/min. Air is blown into the sample containers at their lowest point of travel by an internal airjet. The oven is supplied with 8 glass sample containers and a thermometer (IP 47C/ASTM 13C). Internal dimensions 483 x 450 x 381mm. A separate source of compressed air is required to operate this oven. - Operating Voltage 230 V A.C., Single Phase - Certified temperature control - Digital Display - Internal Fan ACCESSORIES : - Compressor Spares - Glass sample container Thermometer. 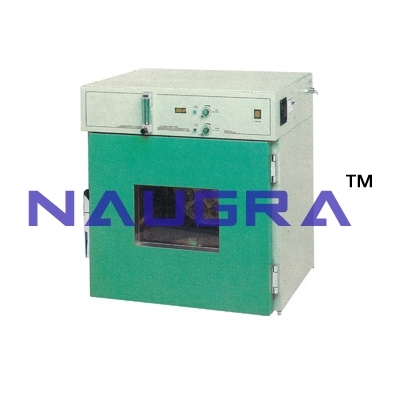 We are leading manufacturers, suppliers & exporters of Rolling Thin Film Oven For Testing Lab for Bitumen Testing Lab. Contact us to get high quality designed Rolling Thin Film Oven For Testing Lab for Bitumen Testing Lab for schools, colleges, universities, research labs, laboratories and various industries. We accept bulk orders for government tenders in all countries around the globe.